To truly understand the Palio of Siena you must live there. You have to grow up in a contrada, a city quarter, a second extended family where to feel at home, surrounded by friends. You’ll recognize the arrival of summer by the tuff laid in Piazza del Campo just a few days before the Palio of the 2nd of July, the one dedicated to the Madonna of Provenzano. A nostalgic grip will close your stomach when, after the Palio of the Assunta of the 16th of August, the tuff in the square will be washed away, because that will be the sign that summer has come to an end. Your calendar will be marked by dinners and parties in the contrada. To truly understand the Palio you must have been born there. Otherwise, you must show a love so strong, a curiosity so genuine and passionate that will allow you to seep in through the meshes of the Sienese pattern and become a local in a contrada. Although I live just thirty minutes far from Siena, I always felt out of place at the Palio, I never felt it mine, I was always missing a piece to understand it fully. In the last years, though, since Tommaso moved from Florence to the countryside around Siena, we had one more reason to live the Palio and experience it with my friend Laura, who was born and bred in Siena. When the contrade arrive in Piazza del Campo, gathering from all over Siena into one single street while singing their anthems, it is impossible to remain indifferent. Their anthems sound like real war hymns: different lyrics, which exalt strengths and virtues of the contrada while mocking the enemies, same melody for everyone. The voices echoing in the narrow streets of Siena get inside your bones and muscles, a visceral reference to a past time. The Palio was born in the Medieval time as an equense tournament, it has a history closely intertwined with the evolution of the city itself, its social pattern and the fortunes and misfortunes of its rulers. After the great plague of 1347 in Siena there were forty-two contrade, which took their names from water springs, churches, streets or gates of the city or from the most illustrious local families. Today there are seventeen contrade in Siena: the division of their territory, their ordering and their organization is due to a woman, Violante Beatrice of Bavaria, governor of Siena. Violante, widow of Ferdinando de’ Medici, had received from her father-in-law Cosimo III, for a round of political intrigues, the Governor of the city of Siena, at the time controlled by the Florentine family. The new governor was welcomed by the contrade in Porta Camollia, the first gate you encounter coming from Florence, on her arrival in 1717: this warm welcome immediately established a bond of deep love among Violante and the institutions and traditions of the Palio. Violante understood immediately that the contrade in Siena were not just a pastime or a picturesque element, they were real and efficient institutions. Therefore she agreed to create a regulation of the Palio horse race: in 1721 the College of War issued the public notice that even now, with some modifications, constitutes the current regulation of the Palio. The contrade ruling process did not end there. In 1730, to put an end to border disputes, Violante issued the famous announcement on the New division of the Contrade boundaries, laying down to seventeen the number of contrade, suppressing some and absorbing others within the remaining districts. The notice also defined the boundaries of each district and the number of inhabitants, so that each contrada could be autonomous and able to sustain itself economically. Nowadays, Violante’s laws are still in force as it is the division of the city centre in seventeen contrade. So here we are in Siena with the tour of Tuscany in cooperation with Ventura. 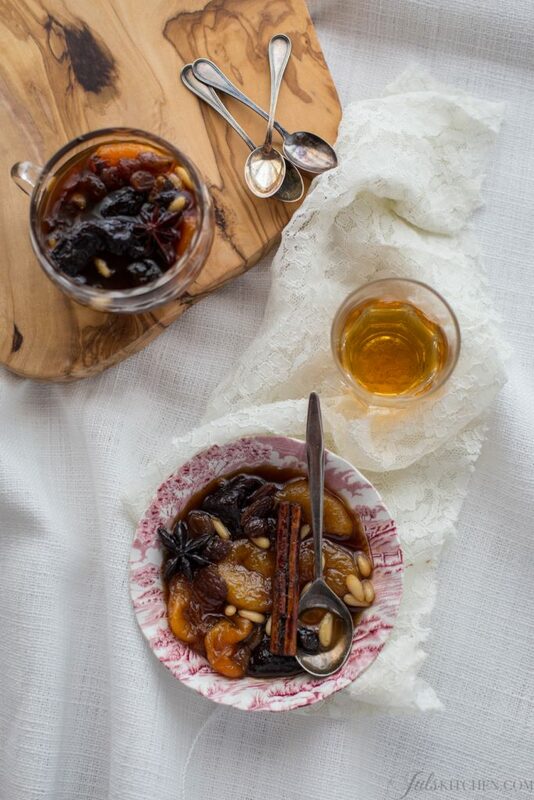 Today’s recipe was a favourite of Violante Beatrice of Bavaria, a spiced fruit compote: prunes and dried apricots are cooked in white wine with a bunch of spices until reduced to a sweet, sticky spiced compote. You can clearly taste her Bavarian influences, though, as according to Giovanni Righi Parenti we due to Violante the addition of raisins and pine nuts, as in the most classic strudel. Easy straightforward desserts are my ace in the hole: a ricotta mousse or chilled peaches in wine are often whipped up in a few seconds. This spiced fruit compote falls into the same category of desserts that you can make with your eyes closed and one hand tied behind your back. They will close a dinner with a sweet note when your friends show up uninvited or they will satisfy your cravings for a sweet treat in a pajama – sofa – TV night. Always remember to keep in the pantry some nuts and dried fruit – such as prunes, apricots, apples and figs – for the emergencies. If it is not your habit, I strongly recommend you to stock up your pantry because you can whip up a memorable dessert within minutes: a handful of nuts, a pinch of spice, some leftover white wine and a tablespoon sugar is all you need. It is easy as that! 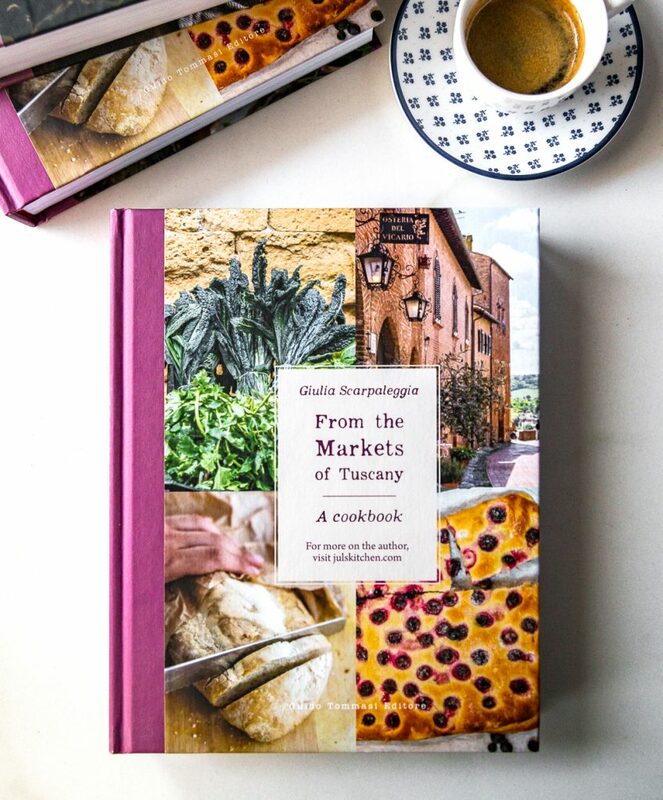 The recipe is adapted from La cucina toscana, by Giovanni Righi Parenti. Pour into a saucepan the wine, the water and the sugar, then add the dried apricots, pitted prunes, raisins, pine nuts and spices. Place the saucepan over low heat and cook for about ten minutes, stirring occasionally, until the liquid becomes a sticky and dense amber golden syrup, glazing every piece of fruit. Turn off the heat and add the vin santo, stir and serve. 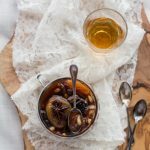 Pour the spiced fruit compote with its dense and sticky syrup into four quaint porcelain bowls or delicate crystal glasses if you want to fully respect its refined and old fashioned character. Serve as a dessert at the end of a meal, better if in windy and cold days that will benefit from holding your hands around the warm bowl. Albeit small, a tiny glass of this fruit compote plays its part even after a major meal with wild boar, tagliatelle with meat sauce or peposo. Its spices will be a valuable help to the digestion, too. It does not end here, though. Once the fruit compote is warm, it marries nicely a gelato or a mascarpone mousse, but also a slice of a simple cake, which will be uplifted to a leading role by the spices and the dense syrup. I tried this compote with my bread pudding cake: what was a breakfast cake became a luscious treat to be served after dinner or as a snack. Spongata, a Jewish jam and nut cake from Lunigiana. Here pine nuts, almonds and dried figs are mashed with orange marmalade, fig jam and apple jam to create a rich spiced sticky filling wrapped in a pastry coating. Pisa and a pilgrim cake, torta coi bischeri. This recipe has the added benefit of being quick to make and being filled with a moist filling of rice pudding, chocolate, candied fruits, raisins and pine nuts. A worthy partner to a cup of coffee or a glass of vinsanto after a family lunch. Buccellato from Lucca. Buccellato is considered a dessert or a breakfast sweet bread, it is made with bread dough, usually enriched with sugar, raisins and aniseed, another widely used ingredient in Tuscan biscuits and sweet loaves. Sweet and sour salt cod from Livorno, with raisins and pine nuts, which perfectly represents the Livornese cuisine, made of poor fish, tomato paste and enlivening influences brought by other cultures, all welcomed and absorbed by a town which is not just a melting pot, but a pot of steaming cacciucco. Biscotti with pistachios and white chocolate from Prato. Not only almonds are added to the Pratesi biscuits, but, depending on the occasion, also hazelnuts (and dark chocolate, something worth trying) or pistachios and white chocolate. This is perhaps my favourite combination, elegant, refined and simply irresistible. 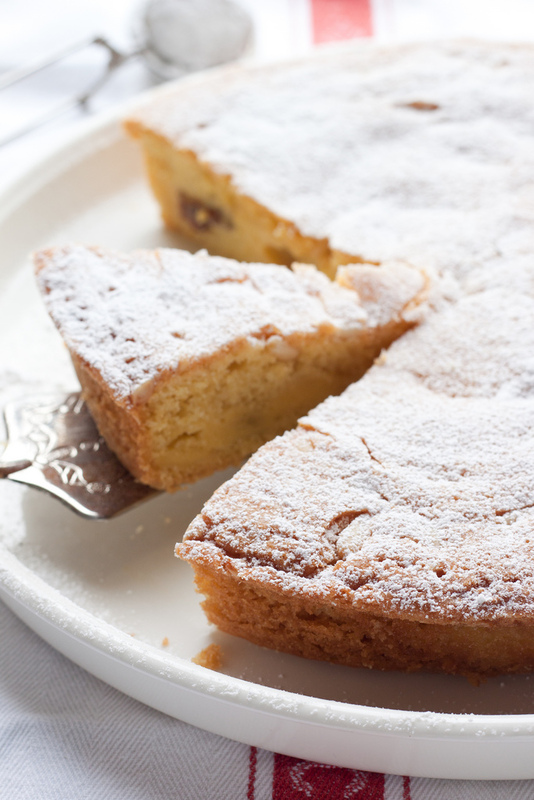 An almond cake from the Tuscan mountains. The tipsy cake forgets humility and modesty, explodes and reveals its charming aromas: the lingering Strega liqueur, the aniseed, so traditional, the citrusy lemon zest and the toasted almonds. Eat the cake in small bites, a sweet heady pause among chats and confidences. Years ago on a visit to Siena my partner realized that the Palio was on his birthday. This was his wish to be there to celebrate his 50th. We did our research and found tickets for the bleachers and a hotel. We knew it would be hot and crowded because even in Oct tiny Siena had loads of tourist! We managed to put down many servings of gelato, I think we tried every vendor inside the city walls. We also did get to experience the Palio from the bleachers where you had about 4 inchs of seating. They crowd those too! You’re right, we felt that we were always on the outside looking in. We got to experience a Contrada Dinner, Oca or Goose. Even then we sat with other outsiders but that was fun just getting to know who was at our table. It’s truly a Bucket List item. I’m going to stock up my pantry with some dried fruit! Thanks! Visceral is the perfect way to describe one’s sense at the Palio. You married the history of this event well with the compote – isn’t that largely what many Italian recipes are about? Complimenti!